Emerald Hills Capital, LLC is a California registered investment advisor (RIA) that manages portfolios based on fundamental analysis. Emerald Hills seeks out quality equities to generate consistent long-term growth of our clients' capital. More than twenty years of experience in both secular bull and bear markets convinced us that investing in small to midcap companies with solid fundamentals produces superior returns compared to attempting to time the market. We maintain razor-sharp focus on holdings in our portfolios and follow company-specific developments closely, as opposed to being distracted by daily market news and macroeconomic forecasting. 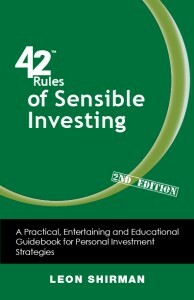 The long-term investment philosophy of Emerald Hills Managing Partner, Dr. Shirman, is summarized in his book, "42 Rules for Sensible Investing". Get your copy from Amazon.